A few weeks ago, I have made the switch from BlackBerry to iPhone. I’ve owned an iPad for almost a year now and there appeared to be no hope that most of the cool apps that iPad offers would ever appear on the BlackBerry OS. I was also getting increasingly disenchanted with the poor browser experience, with the lack of an iTunes-like tool to manage my content library (not that I am enamored with iTunes - a pretty poor program if you ask me) and with a variety of performance issues and freezes that plagued my BlackBerry lately. And so when the renewal time came up, I have made the switch into the promised land of Apple. The calendar is pathetic which I knew from using it already on the iPhone. It does not not support the Exchange categories and so my iPhone calendar is monochromatic in contrast to the colorful experience in Outlook. That’s rather odd considering that this is an Apple calendar - as if the cool hip Mac guy swapped cloths with the chubby dull PC guy. I’m also having issues with the calendar not caching properly which means it always tries to rebuild itself by downloading all data from the server. Pretty annoying actually - even though this issue could have to do with our IT architecture rather than with my iPhone. 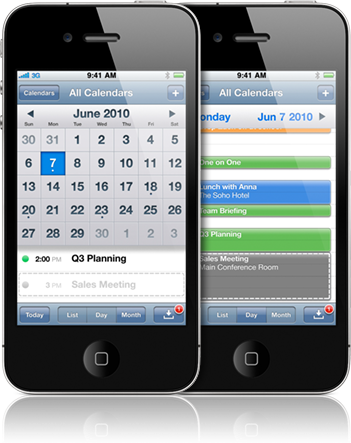 The most glaringly missed feature, one that suggests that Steve Jobs is secretly carrying a Blackberry under his black turtle-neck, is the inability to simply click on a phone number in a calendar appointment to dial it. Conference calls are apparently not something iPhone users are expected to do. This is such an appalling omission that I must suspect that Apple developers never actually used the iPhone 4 for anything but to track the performance of the Apple stock. The calendar does not allow some of the basic functions - I cannot forward an appointment, I cannot suggest an alternate time, the calendar message gets truncated and I don’t see a setting to prevent that. BlackBerry did these things and I need to use them daily. And while I’m complaining about the appointments, here are three requests I have for Microsoft: I want to be able to decline an appointment (saying clearly ‘no’) while keeping it in case my other engagement gets canceled which keeps happening all the time. I also want to see an ability to prioritize my appointments. And finally, I also want to have notes associated with calendar appointment before, during and after the appointment. Where is the search button in email? Seriously? Is there some kind of magical four-finger flick motion I need to learn to evoke this basic function? C’mon, Apple! My iPhone doesn’t allow me to look up people numbers in our corporate Exchange directory. Why not? Does Apple expect me to download the entire directory to the iPhone and maintain it by hand? Steve Jobs must apparently not be calling many people at Apple. Also, phone numbers stored in incomplete format such as (519) 123-4567 cannot be dialed when roaming. Your number has to be in the complete format with a country code e.g. +1 (519) 123-4567. That limitation is regrettable and odd given that the OS knows when I am roaming and what my default country is and could thus easily complete the number automatically. I always thought that the super-app concept from BlackBerry was a little bogus - it touts cross-integration between apps that makes so much sense that I couldn’t imagine it would not be there. Well, I can imagine it now since the apps on my iPhone are completely isolated from each other. The concept is pretty straight forward - for example, every time I see a person in an app, I should be able to access that person’s profile straight from within the app - I should be able to call, email, IM, or whatever other means of communication I have. Similarly, I should be able to share (via email, Twitter, Facebook, etc.) any content asset from within any application. These things are inherent to the BlackBerry OS and yet they don’t exist on the iPhone. Apple’s claim that multi-tasking is supported since iPhone 4 - true, as long as one of the tasks is listening to music. Something as basic as checking the calendar while on the phone is not possible. This one threw me off as I always thought that all those teenage consumers - the primary target audience for Apple - are heavily into multi-tasking doing chats in 10 sessions at a time while talking on the phone, tweeting, facebooking, and doing homework all at the same time. They might but not on the iPhone. These are some of the examples of functionality I miss from my iPhone. They are basic level features used daily by every professional in business. My experience is re-affirming to me what I have already suspected - Apple does not care for nor understand the business user. They will keep piling up awesome features for playing music, movies, talking to friends, taking pictures and all the other things consumers do and love but the business users are not Apple’s priority. I still think that the iPhone is a superior device and I am going to stay with it for now. I am locked into my 2 year plan anyway - courtesy of my customer-loving wireless service provider. But the lack of support for business users is a huge opportunity for RIM which has a massive head start in this space. This is where they grew up and this is where they should dominate. Their marketing messages should be focused on the business user rather than chasing consumers (which I wrote about in December 2010). Business users like me should be told to keep their BlackBerry but nobody is telling them that. Having also traded my BB for iPhone I share your sentiments. There is an app that does a better job of calendaring called miCAL, but I was also expecting more from Apple and considering the popularity if the device. Thanks for the comment. Some of my complaints are possibly just my lack of experience with the new device. I welcome any comments with tips and tricks on how to overcome these challenges. Swipe to scroll all the way up to make the search box appear and once you click in the search box, you are able to search on From, To, Subject or All. You can read more in the iPhone User Guide by following this link on your iPhone: http://help.apple.com/iphone/4/interface. I especially like your two comments on Apple engineers using the iPhone only for watching the stock quotes and your "customer loving" wireless provider. Many things in your list here I can show you how to do or workarounds. Sounds like you haven't uncovered them all yet. I'll find you this week. +1 I like your three Microsoft suggestions: "I want to be able to decline an appointment (saying clearly ‘no’) while keeping it in case my other engagement gets canceled which keeps happening all the time. I also want to see an ability to prioritize my appointments. And finally, I also want to have notes associated with calendar appointment before, during and after the appointment." 1. no fix for that -- haven't seen any apps that preserve the categorization. I've seen a few that allow you to originate categorization/colourization from the iphone, but I don't want to drive my calendaring through that interface. 2. If a phone number is in your notes section, it will dial. I also believe it even supports extended formatting if you use the right conventions (commas, etc) - but it's not as simple as blackberry "x1435" kind of things. Also, I make daily use of ApptDialer -- an app that makes dialing my appointments with complex passcodes happen. Not simple and costs money solves some of the hate for the iPhone calendar issues. 3. You can, but you have to find the message (which is usually in your trash) to forward it. The calendar itself does not and that's a problem. I had the same issues with being unable to forward on blackberry, although it only was for some meetings, not all -- some did indeed forward. 5. It does. Go to contacts, hit Groups (top left), scroll down to the bottom and look for "email@account Global Address List" and that will hit the Exchange GAL. It doesn't always seem to search that however when I pick the "All Contacts" option -- maybe GALs behave differently. 6. More and more of my apps are cross integrated -- dropbox, box.net, keynote/pages (on ipad), logmein -- but that's mostly for content manipulation. I have a few apps that integrate with the contact list that behave like this and have some of the cross integration (although notably only with the specific Apple apps and not things like Skype for example). 7. The multitasking thing is strange to me -- mostly it's pretty good... I have done a bunch more than just music or video (these are all things that lock device hardware like speakers or cameras and as such, should only have one running at once)... However, I really haven't noticed a problem pre iOS 4.3 or after... what isn't multitasking has context switching down, so I don't notice or care that much. Only time I've noticed is when I'm using RDP/LogMeIn or an SSH client. I personally prefer running apps not driving my device performance into the toilet and things like chat sessions and such, I can keep them going without issue. Many thanks for the detailed comments, Nick. I am already discovering and trying out some of your work-arounds. It's still disappointing that I have to learn how to do these things - isn't all this new consumerization supposed to be about intuitive and easy to use software? I find your blog interesting, Its 2014 and I've been a blackberry advocate since the mid 2000's - Starting out with my 8700F on the UK Network; Orange. The massive mistake they made, was pulling away from their Core Business of servicing business users. They were "The" virtual inventor of the Smart Phone but in the business arena. An interesting article I read on cNet stated that "Blackberry only has 10% of apps of that of Android, Apple etc. Here's what happened in my view. Mr Business Guy goes home, his son or daughter starts to play with "Daddy's Phone" ... So Blackberry set its sights on the general consumer: EPIC FAIL! - They should have stuck with what they did best, Business to Business solutions. Its so sad, because they tried becoming something that (in my view) they should have never tried to be. And as a result; they're getting slated and loosing considerable market share because of it. I still have my Blackberry for my work phone today. Its been troublesome since the Blackberry Bold 9700 I had (and I'm just coming to the end of the contract of my Bold 2 9900). Its been an unreliable OS (in my experience) HOWEVER; for day to day business functions that I need to perform, it far out performs any Android or Apple Platform I've used for doing the same basic things.